Great Lost Pop Band: The Naughty Sweeties | Pop That Goes Crunch! A friend posted recently on the scheduled closing later this month of the Santa Monica Civic Auditorium. This prompted memories of bands seen there in days gone by, particularly back in high school. The Jam, The Clash, XTC and even U2 played there back in the late-70s and early-80s. 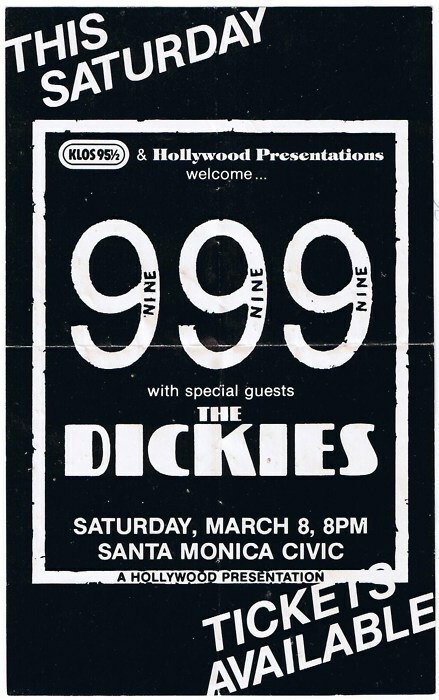 I commented that our parents had driven our 15 year-old selves to and from “The Civic” one night to see 999 and the Dickies. But that also got me thinking. Our parents took us to and from a whole lot of shows before either of us could drive. The Plimsouls in Hollywood and The Who at the Los Angeles Sports Arena came first to mind. But I also recalled a parent-facilitated evening at either The Starwood, The Whisky or the Roxy to see The Naughty Sweeties back in ’79 or ’80. The Naughty Sweeties? They had a local “hit” back then that garnered a lot of air time on Rodney Bingenheimer’s Sunday night show on KROQ. The song also features great hooks, a driving melody, Ian Jack’s increasingly frantic vocals and a pounding chorus about the supposed friend taking advantage of the “hot blooded” Alice. “Why you want to make it when you know that she’s my girl?” Jack pleads as each chorus concludes before the tension begins again. The Naughty Sweeties called it quits around 1982, although the internet continues to memorialize the happening of a reunion show in 1987 to celebrate the 10th anniversary of Madame Wong’s, another local Los Angeles independent music hot spot from the old days. Esther Wong recalled paying the band only $60 to play at her club in 1979. “They had a $300 bar tab,” Wong noted. Drinking the profits. A venerable tradition in rock and roll. It was fun remembering some of those shows we went to together. But now that I think about it, was there something wrong with that picture… parents driving us to see punk rock bands? Our lives were pretty far away from the conditions that created punk rock. But in truth the best of punk rock was no different from the best of garage rock before it and grunge after. It’s all about some kind of honest expression of emotion and it’s all true rock and roll – the stuff of teen angst and adult reflection. Venues come and go, but I hope rock will continue in some form that retains that raw-honest emotion that has been such an important part of our lives. I played drums with the Sweeties the night Esther deducted the $300 bar tab from our pay. We went home poor, but it was still a great gig — I think! Man, I miss those days terribly, and think of the bands, the clubs, and that era as being part of one of the greatest unsung rock scenes ever. Thanks for this. I’m in a band covering “Alice”. This song never left me either. What a great band. What are those guys doing now?